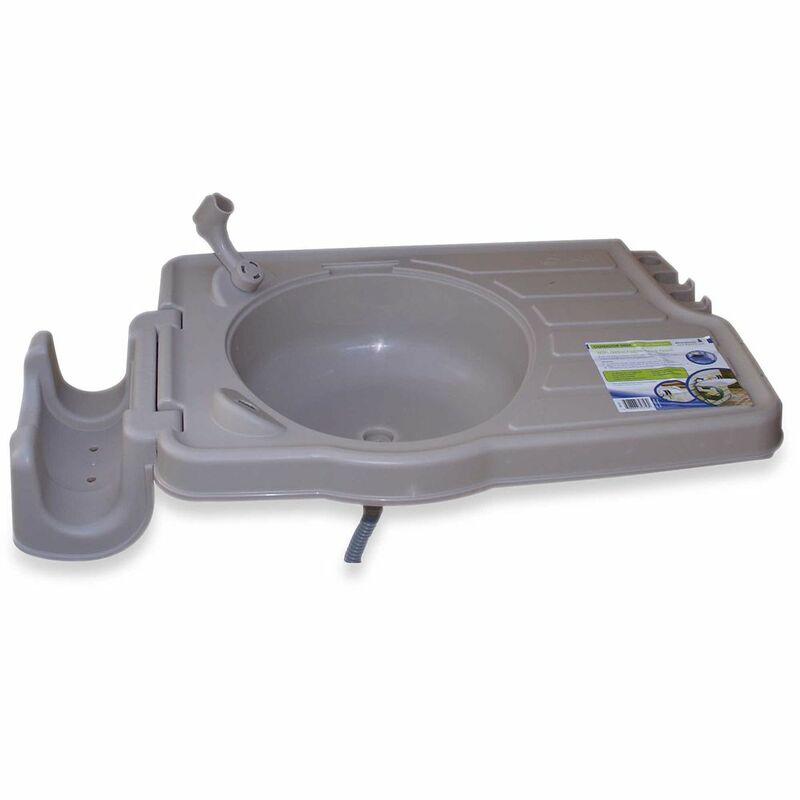 The RSI-S2 larger area work surface sink is a great sink that allows within minutes a fully function sink to be installed outdoors, all that is needed is a standard garden hose. Whether using it to clean dirt off shoes or boots, garden tools, paint brushes, kids hands, cleaning vegetables and herbs from your garden, or just about anything you need to clean the Riverstone Sink works great. The large surface area allows for this coupled with the built in tool storage make this a great alternative to an indoor sink. The detachable hose reel holds up to 200 ft of garden hose. Features: Large sink and work area. Built in tool storage. Outdoor garden sink/watering station. Comes with mounting hardware, drain tube, and nozzle holder. Great for washing hands, cleaning fish. Quick set-up. Soap area built in. Drainage hose included. Holds up to 200 ft of garden hose. Makes washing fruit or vegetables outside easy. Made from durable plastic. Hose and nozzle sold separately. Large outdoor garden sink/watering station with built in tool storage. Comes with mounting hardware, drain tube, and nozzle holder. Quick set-up. Great for washing hands, cleaning fish. Makes washing fruit or vegetables outside easy. Soap area built in. Drainage hose included. Holds up to 200 ft of garden hose. Hose and nozzle sold separately. With its undercounter installation and highly durable, 18-gauge stainless steel construction, this Undertone kitchen sink brings quiet sophistication to your kitchen workspace. Its large, deep basin and smaller disposal basin with rounded bowls are designed for the flow of work in the kitchen and connected for efficiency. SilentShield<sup></sup> Plus, an exclusive sound-absorption system, reduces disposal noise and vibration from dishes and running water for quiet performance. Also available in store by special order only see store for details. Create a beautiful, weather-tight outdoor kitchen to host family and friends. Built to last, with spacious storage, the cabinetry is delivered fully assembled and constructed of powder-coated aluminum inside and out and featuring captured tempered glass doors and drawer fronts. The cabinets feature soft-close doors and drawers, adjustable drawer organizers, adjustable shelves and bottle racks, pull-out trash bins, beverage chilling drawers, and so much more. Riverstone Outdoor Sink- Large The RSI-S2 larger area work surface sink is a great sink that allows within minutes a fully function sink to be installed outdoors, all that is needed is a standard garden hose. Whether using it to clean dirt off shoes or boots, garden tools, paint brushes, kids hands, cleaning vegetables and herbs from your garden, or just about anything you need to clean the Riverstone Sink works great. The large surface area allows for this coupled with the built in tool storage make this a great alternative to an indoor sink. The detachable hose reel holds up to 200 ft of garden hose. Features: Large sink and work area. Built in tool storage. Outdoor garden sink/watering station. Comes with mounting hardware, drain tube, and nozzle holder. Great for washing hands, cleaning fish. Quick set-up. Soap area built in. Drainage hose included. Holds up to 200 ft of garden hose. Makes washing fruit or vegetables outside easy. Made from durable plastic. Hose and nozzle sold separately. Riverstone Outdoor Sink- Large is rated 4.2 out of 5 by 26. Rated 5 out of 5 by David from It works Great, Easy setup, and Great Quality product.... It works Great, Easy setup, and Great Quality product. Rated 4 out of 5 by Monica from Difficult to comment or rate product because purchase was a... Difficult to comment or rate product because purchase was a gift for a friend. Friend has not provided feedback. Rated 5 out of 5 by Jose from A great addition to my backyard bar.... A great addition to my backyard bar. Rated 5 out of 5 by Anonymous from Outdoor sink Just installed it outdoor sink easy to set up used pvc pipe for legs for extra support. Got it way before expected delivery date. Love it. Will come in very handy this summer.